The number stood at 166,275 as on just about 9 a.m. today. That’s 166,275 people ready, willing and able to pitch in, starting tomorrow, to help with one of genealogy’s great crowdsourcing events: the indexing of records through FamilySearch. It’s the 2016 Worldwide Indexing Event. — it won’t event begin until tomorrow — and it’s already a success beyond anyone’s plans or expectations. The idea for 2016 was to round up 72,000 people willing to spend roughly an hour each to help index some of genealogy’s most valuable historical records. Over a 72-hour period, from July 15 through July 17, the goal was to index as many records as possible. With more than twice that number already signed up, and more to come (you are planning on signing up, right? ), we should be able to index record numbers of important documents in this year’s event! So… why is this important and why should we — you and I — help out? The problem is that only indexed records are easy to access. If we don’t know where our John Jingleheimer was living in a particular time period, or we don’t know when or where John died, how do we find him — how do we find his naturalization file or his death record? It’s so much easier to get the important information about an ancestor when we can search by name, and particularly when we can search across geographical areas. But when records aren’t indexed, that kind of searching isn’t possible. The only way to track that elusive ancestor is to go page by page through records that maybe do and maybe don’t have anything at all about our target guy. And the simple fact is that records are being microfilmed and digitized faster than they can be indexed. Even to have a hope of getting the most significant records indexed, we’re all going to have to pitch in. If I help index records important to you and you help index records important to me, and we all help index records important to each of us, we can get so much done to benefit everyone. So… how do we help out? Head over to the web page for the 2016 Worldwide Indexing Event. That’s where you can enter your email address as someone willing to help out, scroll down to download the indexing software and even learn more about how to index and what kinds of records you’ll be able to choose from to index. That’s also the page where you can learn more about the event and about indexing in general — and as the event gets underway, you’ll be able to follow along with the numbers and see how it’s going. This is something each of us can do, at home, in our bunny slippers, to help ourselves and to help the whole genealogivcal community. Come on. 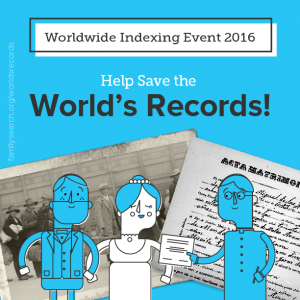 Join me and thousands of our fellow genealogists, starting tomorrow, at the 2016 Worldwide Indexing Event. I’m one of the original 72,000 and delighted that the number didn’t stop with me! I got started indexing during the 2015 event and have signed up for the 2016 event! I went to the site but no where did I see what type of records will be indexed; i.e., deed records of a particular county during a particular time period is what I would like to do. Is this an option? I have done these for a few years. There are all types of records in multiple languages. You will have the opportunity to select records in languages in which you are fluent as well as types of records. You should select a batch designated as easy or beginner (can’t remember the term) if you have not indexed before and then search for a batch of interest. DO not think you will find your relatives doing this – although there is always a chance – but hope some other volunteer might and you find their’s! It is a great way to give back. I signed on a couple of weeks ago and tried my hand at indexing West Virginia WWII draft cards. Fascinating – a learning experience. Will be active this weekend. SO important! Thanks for the reminder – I didn’t see an email from FS! I broke my ankle so can give lots of hrs this year. As you state this is so important. I have browsed record sets page by page – both microfilm and online at FS and it is slow. Unlike Ancestry, FS depends on volunteers and there is a process in place to help with accuracy. That is why I can find records there that I can’t find on Ancestry. Even one batch helps – please give back everyone! Ready and willing. Be the first time for me and Sandy so thanks Carolyn Lea for the “select beginner” tag. that little piece of info will get us started in the right place. Stan and Jean – They will also have batches – if it is as usual – marked priority – these are the ones they would like to get done first. I always try to do a few batches of these in addition to batches that may be of interest to me. Good luck to you both and FS can help you with questions. Thanks Judy for writing about this, I would have totally missed this event had it not been for your blog. I needed a project for today while the husband is at a college alumni group board meeting. I was wondering which of these ethnicities are real, and which ones are just statistical noise, specifically the Southern European and Middle Eastern. I read your blog post "Admixture: it's not soup yet," and really was wanting to know if my ethnicities were true or not. Thank you! You can absolutely rely on the fact that you’re just about entirely European. At the continental level, you can take it to the bank. Everything below that level is a crap shoot. Sorry — it ain’t soup yet, and it may never be. You can use the results as a hint, but that’s all. Oh ok. They can’t even tell apart the Eastern from the Western European? Because I know British, Irish, Scandinavian, and Europe West are indistinguishable. Also, not on Ancestry, but on DNA land, I get 2.6% Finnish. Is this real, because I heard that they have really distinct DNA? Every company has its own reference population of now-living people to whom your DNA is being compared. Some have better reference populations than others, and even with the very best, just what exactly distinguishes eastern Germans from western Poles? THAT’S the problem. Oh, that makes a lot of sense. So, when they say Eastern European, they may just mean “Slavic.” My great great great grandmother was from Pomerania. What about the West Asian percentage? Is that real or just noise? Jake, you need to do some basic research here and learn to understand your results. Start with Kelly Wheaton’s Beginners Guide to Genetic Genealogy. Ok, I will read these pages. Thank you. I am just really confused as to why they would assign me the ancestry if it doesn’t exist. Again, read about ethnicity estimates, understanding that they are estimates based on comparisons to other living persons. That’s all the estimates are — estimates. So, basically, they are saying around 2% of my DNA looks somewhat similar to the living peoples of the Middle East today? Whoever the people are who were used in the reference population, and you’d need to read their white paper to get more information. You need to do some reading here to understand more. Ok, so I am basically just 100% European, I guess. That is what I mainly wanted to know. Sorry if I am ignorant towards the subject; I am new and want to learn as much as I can about genetic genealogy. I will read Ancestry’s white paper.